The 70s and 80s were a strange time for television shows, with oddball concepts like The Six Million Dollar Man and The Incredible Hulk dominating airwaves and gaining their own individual cult followings, despite their bizarre roots. It’s only fitting, then, that a member of one of the more surreal comedy groups of recent years, Julian Barratt of The Mighty Boosh, is partly behind this equally mad homage to those odd shows of yesteryear, which delivers enough laughs to satisfy, but not enough to overlook its more glaring imperfections. Barratt stars as Richard Thorncroft, an actor best known for the mid-80s Isle of Man detective show Mindhorn, where he played a cop that has been fitted with a bionic eye that can literally see the truth. However, Thorncroft’s inflated ego and over-ambitious dreams of making it big in Hollywood have led him to become a balding, unemployed actor in the present day. Things begin to perk up, however, when he receives an offer from the Isle of Man police who want him to come and reprise the Mindhorn character, so that he can communicate with a serial killer (Russell Tovey) that believes Mindhorn is a real person – an offer that the publicity-seeking Thorncroft cannot refuse, especially if it also helps him reunite with his on-screen and formerly off-screen lover Pat Deville (Essie Davies). The film is a loose collection of awkward humour and moments of pathos that, while funny, feel eerily similar to another larger-than-life British character, namely Alan Partridge, and that is honestly Mindhorn’s biggest problem. No matter how hard it tries, the parallels between the main character in this and Steve Coogan’s most famous comedy creation are just too great to ignore, as both of them are high-profile personalities whose rampant cases of narcissism and overwhelming desires to reclaim the fame and fortune they once had earlier in their careers, so this just feels like a copycat version instead of being its own thing, with jokes and scenarios seeming as though they’ve been lifted from one of Coogan’s own shows. In fact, Coogan himself turns up in a supporting role, as an actor on Thorncroft’s show who spun-off into a much more successful show, making the similarities even more impossible to ignore when it’s literally right there on-screen in front of you. Although the character of Thorncroft is fine and gets a good amount of laughs from his ego-driven negligence, the similarities are just too similar that it’s actually distracting half the time. This is a shame, because Barratt and co-writer Simon Farnaby (who also shows up as Thorncroft’s eccentric former stuntman) do create moments of comedy that more often than not land, and there is enough laughter spread throughout to leave you satisfied that you saw it at least once, especially if you’re a fan of Barratt’s sense of humour from his days in The Mighty Boosh. Barratt sells his character’s oblivious charm to a tee, and a lot of the laughs you’ll likely get from this film are purely from his cool-cat delivery and committed physicality, particularly for a large leg of the third act where he’s unwillingly glued to a puffed-up version of his younger physique. However, the laughs disappear whenever it gets into the main “mystery” of the film (I use quotations because the twist is so bleedin’ obvious from their very first background appearance early in the film), which is where the film also takes a dive into a climax that’s almost like it’s been lifted from another, slightly less ambitious crime comedy. It all leads to a resolution that’s pretty predictable and not entirely satisfying, though the ride was a little more fun than expected which made the journey a little more worthwhile. It’s not the year’s best comedy by a longshot, but Mindhorn is still a wholly adequate and amusing movie that should tickle your funny bone enough to leave you with a smile and a giggle, though don’t act too surprised if after seeing it you’re suddenly urged to go back and watch any one of Alan Partridge’s past projects – after all, it’s not like they can be fully replicated, and this film is proof of that. 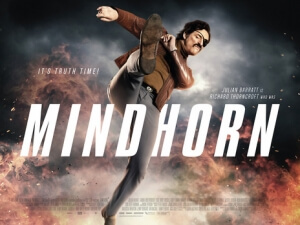 Mindhorn is an amusing British comedy with some decent laughs sprinkled throughout as well as a committed lead performance by Julian Barratt, but the similarities between its lead character and Steve Coogan’s Alan Partridge are too great to ignore, and while there are some strong moments of comedy it’s not enough to overlook its predictable plot and unsatisfactory resolution.